Automate your occupational therapy prior authorizations with software driven by artificial intelligence (AI) and exception handling by certified specialists to preserve more revenue. Occupational therapists did not go to school to manage prior authorizations, yet that is often what happens. An important service for a patient is derailed because a prior authorization is required. And the long, arduous process of obtaining authorization begins, and it becomes pain-staking. The complexity of the process taxes staff to the point that denials go up. 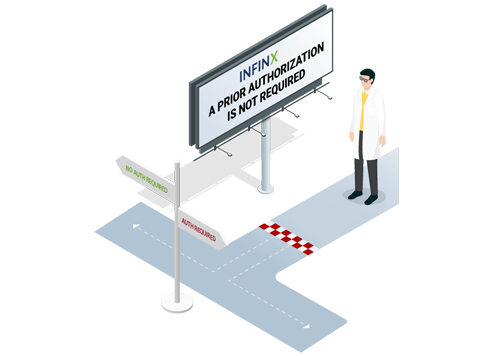 Infinx’s Prior Authorization Software for occupational therapy practices blends automation, integration, cognition, and control to offer you an optimized workflow. It leverages artificial intelligence (AI) to optimize your processes, including our real-time No Auth Decision Engine, making it easy to discover cases that don’t require waiting for approval. Cases needing more in-depth attention are forwarded to our global team of specialists who can process your prior authorizations with speed and impeccable accuracy. learn more about our prior authorization software for occupational therapy.